Discussion in 'CNC Mills/Routers' started by CatalinM, Jan 3, 2019. Not sure if this is the right place to post this, but I'll happily (re)move it if it's not ok. I'm the unhappy owner of a Chinese CNC3018 machine. I know this is at the bottom of the low-end of machines, but given some space/weight limitations, it's the only thing I can use right now. Therefore, I'd want to get the most out of it and I hope a few upgrades might do the job. I should note I'm aiming to mill 1.5mm thick aluminium sheets - most of the time, I'm just looking at round holes and slots and some engraving. Ideally, I'd like to go up to 3mm if possible. Now, having used the machine a bit, I've concluded its biggest problems are related to the spindle (which lacks power and quickly loses speed) and the huge play it has on the Z axis (in part due to the shabby spindle holder and the flex in the X axis). I'd like to replace the whole X/Z carriage and I was looking at these: https://www.ebay.com/itm/Ball-Screw-...?&shqty=1#shId. They have both a 400mm X axis and a 60mm Z axis version that fit well together, even if I don't know exactly how I could fit the X axis to my machine - I'm thinking a pair of steel brackets should to the trick, assuming they can be attached on the back. Having that installed, I could get a bigger spindle, although I don't now how big should that be - maybe 1.5kW (or even 0.8kW if it's enough). I'm open to suggestions here. Also, I'd appreciate a thought on this endeavour. Is it worthwhile? Are there better alternatives keeping in mind these size/weight constraints? I suggest that you junk the Chinese machine and buy one of the machines at Open Builds store. Kevon Ritter and Peter Van Der Walt like this. Whether or not these are worthwhile comes down to what you intend to use the machine for. As for how well they'll fit, it's hard to say as you really haven't given us much information beyond a model number that is used on quite a few different systems. You'll need to give us a much better idea of where you're headed with this and what you already have to work with. Based on what I'm seeing you need to be thinking more in the 300W-400W range. The ones you mentioned are far too large and heavy for such lightweight rails. Rick, indeed... it's rarely quite that simple. I have to work within both size constraints(say 40x50cm) and weight constraints (say 10kgs / 20lbs) due to the fact that I do not have a proper workshop and work out of my (albeit large) kitchen. Also, I would _ideally_ need the machine to fit a workpiece of 25x50. I can accept the fact that what I want is not possible and I will look at other solutions like outsourcing my builds if that is indeed the case. My main use for the machine (besides engraving PCBs which I can do on the 3018 right now) is cutting and engraving aluminium sheets of 1.5mm thickness (1/16" I think). I'm using these to build enclosures for my electronics projects, so I need to cut outlines as well as holes of different sizes and slots. I would be nice if I could work with thicker aluminium for front plates, without the need to cut outlines there - I can do this on my table saw which is sufficiently powerful. Looking at my current spindle, I see (looking at the specs of a similar item on ebay) that it's rated at 7W (36V, 0.2A). If that's the case, then I agree, 3-400W should be more than enough - I've managed to cut 1.5mm aluminium on my machine, even if it was horribly slow and stressed out the machine (and the end mill as well). Out of curiosity, do you see any flexing or twisting as it works? It's build, potentially, is mechanically good as far as I can see. Is there lots of play within the parts themselves, or does it feel tight and sound? I wonder if you could brace it here and there. Perhaps extra side support on your gantry? What sort of gauge are the X-Axis cross members and rails? Look into high speed machining (HSM) and its use in maximizing utility of lower-rigidity machines. This is increasingly used in industry (as floor space gets tighter and raw materials get more expensive, so smaller, faster, less rigid machines become more economically viable) and is often outright faster than traditional machining when properly optimized. For example, in your case, instead of doing, say, 3 passes at 1mm depth of cut at 25mm/s & 8000rpm, you'd do 20 passes at 0.15mm DOC at 500mm/s and 25000rpm. Whatever the numbers are, I'm making them up, but you get the idea. The second option allows you to get similar material removal rates with a lower power spindle and less cutting force on the machine frame, because you're taking lots of tiny bites very quickly instead of slow, monster bites that take a lot of force and power to push through. The downside is, you may need to look for a higher-speed spindle than the typical 24k units. I'm currently shopping around for 400-800W 40-60kRPM spindles for this very purpose, though nothing particularly exciting has sprung up just yet. Adding reinforcement plates is almost always a fairly straightforward option on these modular aluminum machines, as well. GrayUK, CatalinM and Craig Cavanaugh like this. "Look into high speed machining (HSM) and its use in maximizing utility of lower-rigidity machines." I had booked marked this link and this link some time ago thinking it would be viable for a small machine. It's suggesting speeds upto 20-30K rpm and the parts are well within the capability of your machine to produce and bootstrap. A couple of thoughts on the upgrade using the ebay parts. The 400mm actuator for the X-axis is really not needed as you can simply take the concept of how it is built and apply it directly to what you already have with far better results. Note the round rod embedded in the sides of the actuator. Find similar rods and epoxy one in the top channel of the existing upper t-slot on the X-axis and a matching one in the bottom of the existing lower t-slot. Then you just need to cut a gantry plate and add some U-groove bearings to run on the new rod rails. The existing X-axis screw drive will need to be coordinated with new plate so some adjustment or even moving to the back side of the axis may be necessary. As an alternative, replacing the X-axis T-slot with some V-slot and building a Z-axis from OpenBuilds parts is also an option. Concept shown below. It requires some hand cut plates but this is fairly simple. Sketchup model is attached below. Please note it is close but not completely accurate, merely sufficient to convey the concept. Look into high speed machining (HSM) and its use in maximizing utility of lower-rigidity machines. This is a very interesting concept. I'm gonna start looking into the links that Craig posted and look for some spindles to see what my options are. Maybe go somewhere in between with speeds around 15k and slower feed rates. That looks really interesting and something I can put together quite easily. I'll look into the design tomorrow and figure out the details (moving the lead screw seems like the trickiest part). Thanks a lot for your help! PS: I see OpenBuilds beams come in 250mm increments. Any chance to order custom lengths? Like 400mm. 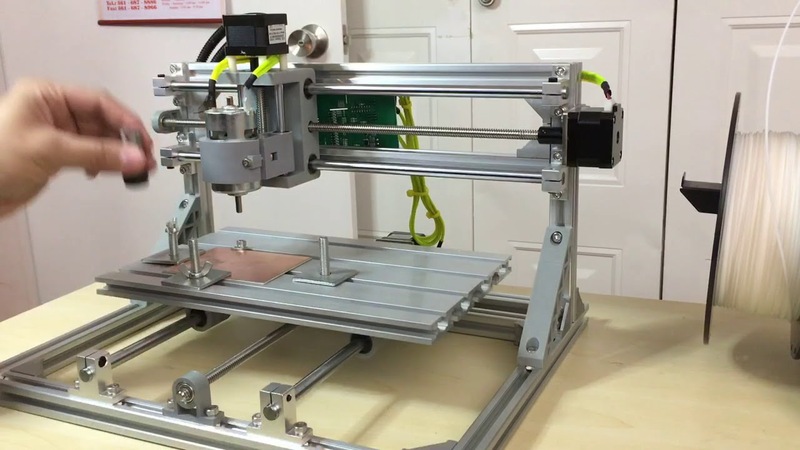 OpenBuilds has bought the saw but is not quite up and running with it yet. But you're better off checking with Ooznest anyway as they are on your side of the pond. Oh, that's really nice - should make shipping faster (and cheaper). Are they related to you guys? I see the products look kinda identical. - if that doesn't fit, I'm not sure how I can get the Openbuilds anti backlash block far enough back to reach the screw - adding some spacers doesn't seem like a good idea considering it only has 2 mounting points. Suggestions are welcomed. For the Z-axis, I'm thinking about getting a complete C-beam actuator to avoid building the end plates myself (I don't think I can make them precise enough). The other options would be to build one from 2 V-slot beams as Rick suggested (maybe getting a mounting plate for the Nema 17 I already have and build the bottom plate myself). Still haven't decided yet. As for the spindle, I'm considering this 400W brushless version (Branded Short Domain Powered by Bitly), but I'm a bit off-put by the 12000rpm limit. I'm still considering an 800W spindle (24000rpm) especially if I would get the C-beam with Nema 23. Are they related to you guys? Ooznest is an authorized OpenBuilds distributor. You use double stick tape to hold the top and bottom plates together and drill through both at the same with a 5mm bit. The holes are in perfect alignment and the 5mm shoulder snugs right up to the hole for perfect alignment. Indeed it is. I would be more at ease if I had any certainty that the 400W spindle is enough. In any case, the problem of aligning the nut to the screw on the X axis still stands. Is there any spacer block I can use? Or maybe think about switching to a belt transmission? The spacer block doesn't need to be anything special. A small block of acetal or other plastic will usually do the trick. If you're looking to reduce the length, you can always move the rails forward which brings the screw in closer to the back of the plate. As for the spindle, you may find a 300W might even work for your purposes. You're only using a 3mm bit and it doesn't take much power to spin one. I suggest looking back through the build section for members posting builds with smaller spindles and checking with them on their level of success. Funny thing... as I went out earlier I kept thinking about this and I arrived at the same solution: moving the beams forward. I was also thinking I could use C-beam end mounts with a custom adapter for the existing Nema17 motor. I'll do some research on the spindle in the meantime, until I finalise the design, but I finally feel I'm getting somewhere. Thanks for all your help. I'm thinking it might be a good idea to open up a new thread about spindles hoping it will catch more attention. I don't want to move forward with upgrading the Chinese machine until I'm fairly certain I can get a usable thing out of it. Otherwise, I'd be better off building a smaller C-beam with Nema 23s that can hold a 1.5kW spindle. Therefore, it seems that using a 1/8" 2 flute end mill would need around 45mN of torque at 12000 RPM if trying to achieve 250mm/min feed. Of course, this is only theory, but the spindle I was looking at is rated at around 529mN-m (it's not stated at what RPM this is true though), so I'm thinking there's more than enough headroom there for my machining needs. I've asked the seller about their 500W brushless, as it wasn't specified on the product page and they told me it was rated at 500mN-m and had a weight of 1.5Kg. I'm still waiting on specs for the 400W version, but I would assume weight is slightly slower. Would you guys think the existing Nema 17 can handle that weight? All in all, it seems the 400W is enough for my needs, so once I get hold of the weight, I can go ahead with the rest of the project. It's not about the weight, it's about the force (Newton's third law!) that the spindle is putting on the steppers. You want less torque, not more. Those calculations are the exact reason HSM works. Not to mention, the lower your speed/higher your torque, the more you're trying to flex the machine frame itself as well. Everything is linked. I get what you're saying... but I'm thinking overall spindle weight is an issue as well. I mean, putting it a 3kg spindle on this machine seems like a bad idea - I'm talking mostly about the Z axis where I was thinking the weight would be an issue. Problem is I haven't found a low (enough) torque and high speed and low weight. The DIY solutions Craig posted seem a bit too complicated for my current tooling, I'm afraid. Oh, sure, to some degree, obviously- your acceleration, F=ma, is directly linked to total carriage weight. I doubt it's an enormous concern, though, when you're talking about putting a spindle with hundreds of Nm up against a stepper with what, maybe 0.5Nm? It is a general issue though, for sure. Wait wait... there seems to be a slight misunderstanding. The 400W brushless is rated at 529 mN-m - that is mili Newtons meter. So in that regard, it would be the same(?) as the stepper. Ohhh, MIlLI-Nm. That’s a pretty substantial difference. Yeah, that would be the same as the stepper, more or less. Which, unless the spindle actually binds up (and even then, it would depend on the toolbit/pulley diameters) the stepper should never see, so that’s great! Phew. Got me scared a bit there... thought it was really Mission Impossible. In that case, if the weight (say 1.3kg) isn't a problem for the Nema 17s, I'll go ahead and order the spindle! That's basically 3lb, which should be doable for NEMA 17s with moderate accelerations, even with belts. With screws, it shouldn't be an issue at all, because you have a much higher torque multiplier. I've finally received all the parts (including new spindle with it's own controller and power source). Everything seems to go together quite nicely, except for one thing: the X lead screw isn't perfectly true and as such feels a little wobbly(?) when turning it by hand. This may not be an issue for the stepper, but I'm concerned about wear on the anti-backlash nut in time. Here are some pics of the whole build. I just have to fabricate some brackets for the steppers now and a plate for the spindle (I'm thinking about a 6mm alu plate for that one). I would also consider replacing those vertical extrusions (holding the z & x axis up) with something like 20mm x 60mm extrusions to increase rigidity and reduce deflection. You could also add some angled supports or gussets. The top x & z axis are looking good though. Actually, what size are those original extrusions? 2020? Yeah, the original extrusions are 20x20, but they do have angled supports... they just weren't mounted yet when I took the pictures. I'm still concerned about the x axis lead screw not being straight. Any thoughts on this? Screws not being straight is somewhat normal, really- maybe from shipping or storage, I dunno. If you have something that can serve as an arbor press and a dial indicator, you can push it back into straightness. This also sometimes has to be done with ballscrews. I straightened out a couple of my ballscrews using a couple of v-blocks and a dial indicator. Google will provide some examples but just how bent are they?